TajMo: The Taj Mahal & Keb’ Mo’ Band sees Blues titans Taj Mahal and Keb’ Mo’ share the stage with their band for an exciting night of music, performing songs from their long-anticipated collaborative album TajMo, coming May 5, 2017 on Concord Records. 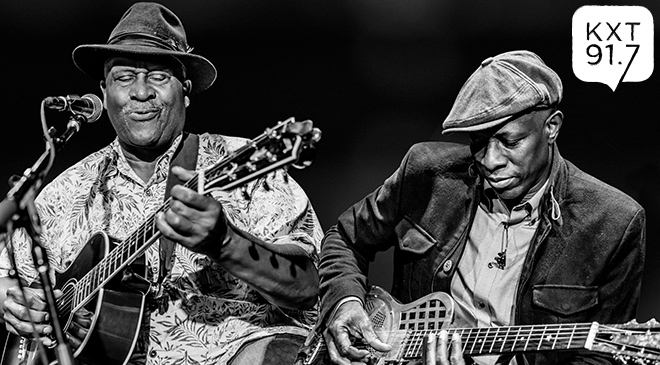 While the two have known and influenced each other for decades, and Taj played a key role in Keb’s first record deal, TajMo marks the first proper collaboration between Taj Mahal and Keb’ Mo’. The album was self-produced by the duo and was mixed by Grammy Award-winner Ross Hogarth and mastered by* Grammy Award-winner Richard Dodd*. The 11-song set includes covers of John Mayer and The Who, as well as 6 original songs. TajMo brings out the best in both artists, with the pair merging their distinctive voices, personalities and guitar styles to create vibrant, immediate music that’s firmly rooted in tradition yet ruled by a playful sense of adventure. “Don’t Leave Me Here” is a love letter to the south that sounds like an instant classic, and “Soul” interweaves world music with blues in a way that only Taj could pull off. Taj and Keb’ put a soulful spin on Mayer’s “Waiting On The World To Change”, on which Raitt lends her unmistakable vocals. Taj Mahal has been recording and performing his unmistakable blend of blues and world music for over 50 years, winning multiple Grammys and collaborating with the Rolling Stones, Eric Clapton and more along the way. Keb’ Mo’, who has often cited Taj as one of his musical heroes, is a 3-time Grammy Winner who has collaborated with everyone from Raitt to Jackson Browne and Buddy Guy.